Tobacco-brown silk taffeta brocade set of bodice and skirt, brocaded with floral pattern; braid and lace on bodice; large triangular shawl of black Chantilly lace. With its impressive protrusion towards the backside, the object shown here is a good example of a crinoline dress. 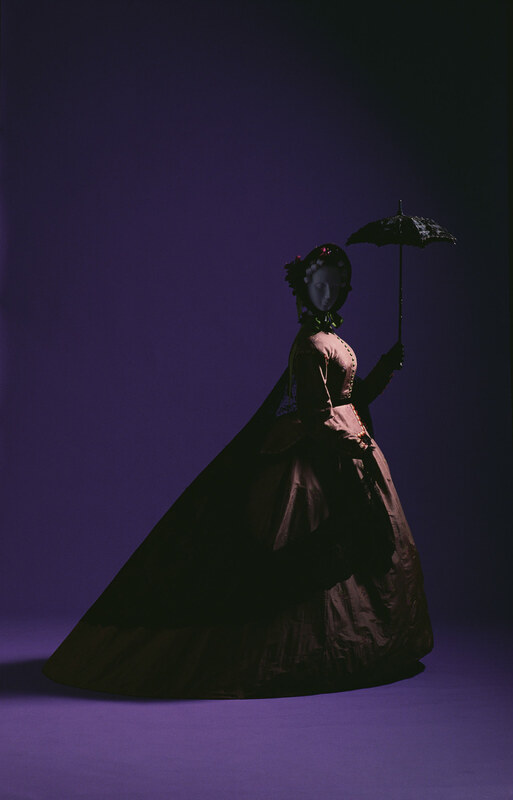 During the 1860s the silhouette of the woman's dress slowly changes, the volume of the skirts tends to be concentrated on the backside. Wide skirts together with big shawls became popular as they were considered elegant and protected against the cold at the same time. Not only cashmere, but also lace shawls were in vogue. Lace, which until the 18th century was a costly fabric that demanded plenty of manual labor, became to be produced mainly on machines during the 19th century. As a result, large-size, sumptuous and delicately designed shawls were increasingly fabricated. In France, Chantilly, Valenciennes, and Alençon were famous for lace production.